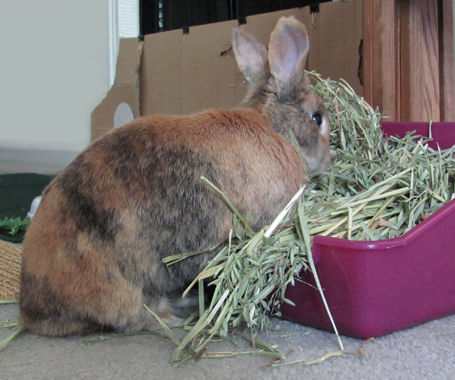 Earlier I promised I would share some bunny photos. The photo of Tigger was taken with my camera on its table top tripod taken to the floor to catch her at her level. While I was taking it, I felt a furious tugging. 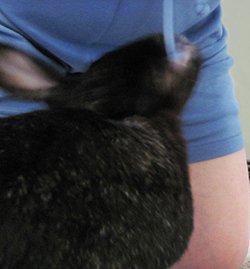 I quickly rotated the camera around on the tripod and got the shot of Shadow attacking the drawstring on my shorts. I couldn’t see to focus this second shot. It was a quick swivel around and shoot blind by just pressing the button to capture the shot. But it gives a great view of what was going on in front of the camera and behind the camera at the same time. I would not have been able to get the shots of both Tigger and Shadow in action without my camera setup the way I showed in my earlier post on Catching Bunny Rabbit Photos . This entry was posted in Photos and tagged attitude, bunnies, bunny, house rabbits, photo, photography, postaday2011, rabbit, rabbits, Rabbittude News & Shops by Rabbittude. Bookmark the permalink.